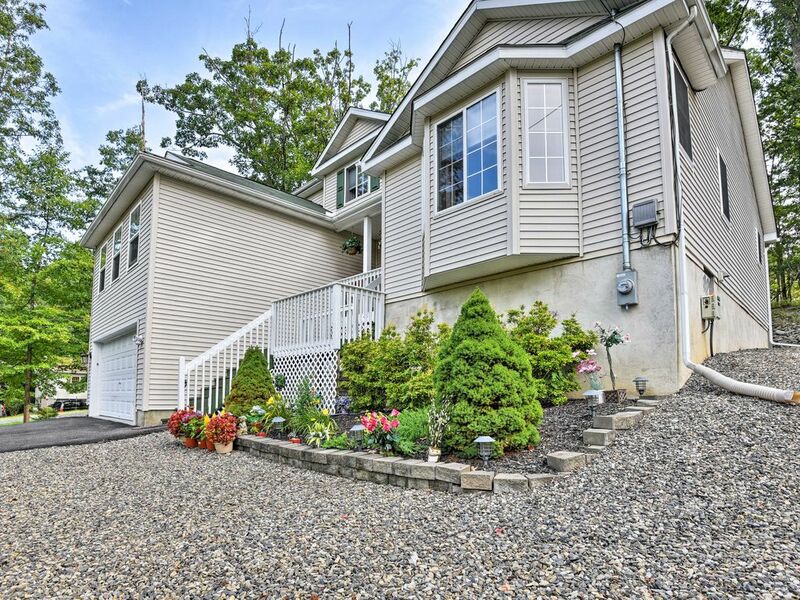 Experience the peace and privacy of Pennsylvania from this exceptional 4-bedroom, 2.5-bathroom Bushkill home. With a number of amenities and a tremendous location near an abundance of outdoor attractions, this home provides you with everything needed to have a special vacation with your loved ones. This vacation rental comfortably sleeps up to 16 travelers on an unforgettable adventure. This serene property will help you unwind from all the stresses of everyday life. Spend downtime socializing with your friends outside on the private deck, where you can lounge in the new patio furniture with seating for 6 at a glass table and fire up the new grill, all while witnessing incredible forest scenery. Within the gated community of Saw Creek Estates, you and your companions will be able to enjoy access to a community ski slope, beach, walking trail, fitness center, tennis courts, basketball courts, and many more amenities that will ensure a rejuvenating and entertaining stay for all. At the end of vacation days filled with thrilling adventures, look forward to returning home to the 2,400 square feet of elegantly appointed living space, including a 400-square-foot great room, a beautiful 200-square-foot living room and a basement with a ping-pong table, where you'll love gathering with your companions. A fully equipped kitchen with all of the necessary cooking appliances will allow you to prepare delicious home-cooked meals throughout the duration of your stay. Additionally, you'll find all of the comforts of your own home are provided here, including wireless internet access, laundry machines, and 4 sets of ceiling fans in the living room and 3 bedrooms. Later, mix up your favorite nightcap and head outside to gaze up at the clear sky to count the constellations. The property's truly unmatched location will help you discover a variety of outstanding attractions, all within arm's reach! Outdoor enthusiasts will absolutely love their stay here, with the family-friendly Shawnee Mountain Ski area only 15 minutes away and Camelback Mountain resort a short distance away! For an amazing family outing, visit the gorgeous Bushkill Falls, which boasts a series of 8 stunning waterfalls. Saddle up and horseback ride through beautiful scenery at Sugar Mountain Stable. Visit the Pocono Indian Museum to learn about the intriguing past of the Pocono Indians and buy a souvenir for a friend back home. For entertainment, travel 30 minutes to The Crossings Premium Outlets and buy something for someone special back home or test your luck at the Mount Airy Casino. Grab your clubs and friends and head out to one of the five pristine golf courses nearby. - Unbeatable location - minutes from Bushkill Falls, Shawnee Ski Resort and golf courses! Perfect home for winter a getaway with friends. So many amenities within the complex is great. Beautiful property with all amenities.10 mins drive from Bushkill falls.Loved the stay.. It was as advertised. Comfortable and perfect. It was exactly what was needed. Property was clean, comfortable and roomy. We were there for a family reunion and had a great time. We stayed here for 3 nights. We were 10 people including 4 kids. The house was not too far from the security gate so it made driving in/out of the community convenient. The house itself was very well stocked with everything you need. Every room had air conditioning. Enjoyed our stay very much. Book this home for your next vacation or getaway to Bushkill, PA! You won't be sorry! Very lovely, clean, cozy, comfortable Home. Booked it for a weekend getaway for my husband's 40th birthday. 8 people in our party stayed here and the house accomodated everyone. There are 3 bedrooms with queen size beds and one with a twin bed, but there was an air mattress, a cot, and couches where people could sleep as well. The furniture in the house was very comfortable. Has 2 living/family rooms with tvs and 2 dining rooms, one with a very large table that sat 8 people. The kitchen had everything you needed to cook dinner. Fridge with ice maker. Outside has small deck with gas grill. The master bedroom has a huge bathroom with a 2 person tub. The owner/rental agency answered all my questions and booking was simple. Received all info and home entry instructions well before our check in date. Home has wifi as well which you will need as cellphone signal is non existent for most cell phone providers (the mountain blocks the signal). The home is located in a gated community of Saw Creek Estates and is very secure. The pool and restaurant at the top of the world resort area was very nice As well. I would definitely book this home again and would recommend to anyone looking for a nice house for their vacation. We had a great time here. We were a group of 10 with 4 kids. The house was very nice, clean, fully furnished and with all the amenities we need. Highly recommend.